A new study finds that TRAP (targeted regulation of abortion providers) laws are more numerous and stringent than OBS (office-based surgery) laws. Almost two years after the U.S. Supreme Court struck down a Texas law that the justices said imposed burdensome requirements on abortion clinics, such laws still exist in 34 states, including Pennsylvania, according to a new study. The analysis, published this month in the American Journal of Public Health, found that many states regulate abortion clinics "differently and more stringently" than centers providing other office-based medical procedures, such as cosmetic surgery. That conclusion echoes previous studies of so-called TRAP laws – "targeted regulation of abortion providers." But the new review, led by reproductive-health researchers from the University of California-San Francisco, is more comprehensive and offers a novel web-based tool created by Temple University health-policy researcher Lindsay K. Cloud: interactive maps that compare each state's abortion clinic laws with outpatient surgery laws. Overall, abortion clinic regulations are more numerous and strict, variously covering room and hallway sizes, physician qualifications, infection control, ventilation, power backup, hospital transfer agreements, even disaster preparation. Some states' requirements extend to abortion providers who offer only the abortion pill, not surgical abortion. And abortion providers face tougher penalties, such as fines and criminal charges, if they break the laws. "TRAP laws have not been found to be medically necessary. They're doing more harm than good," said Cloud, director of Temple's Policy Surveillance Program, which has created legal atlases for tobacco, alcohol, food safety, and other health regulations. Proponents of TRAP laws say the goal is to protect women's health, but that argument did not sway the U.S. Supreme Court in the Whole Woman's Health v. Hellerstedt case. In June 2016, it rejected Texas' requirement that abortion clinics have hospital-grade surgical facilities and that doctors get admitting privileges at a local hospital. The law, which did not allow waivers or exemptions, led to the closure of about half of the state's 40 abortion clinics, and the number would have fallen further if the law had been upheld. The high court declared the law provided "few, if any, health benefits for women … and constitutes an undue burden on their constitutional right" to abortion. The 5-3 ruling was the most significant since Planned Parenthood v. Casey, the 1992 Pennsylvania case in which the court said states could impose abortion restrictions as long as they did not create an undue burden. 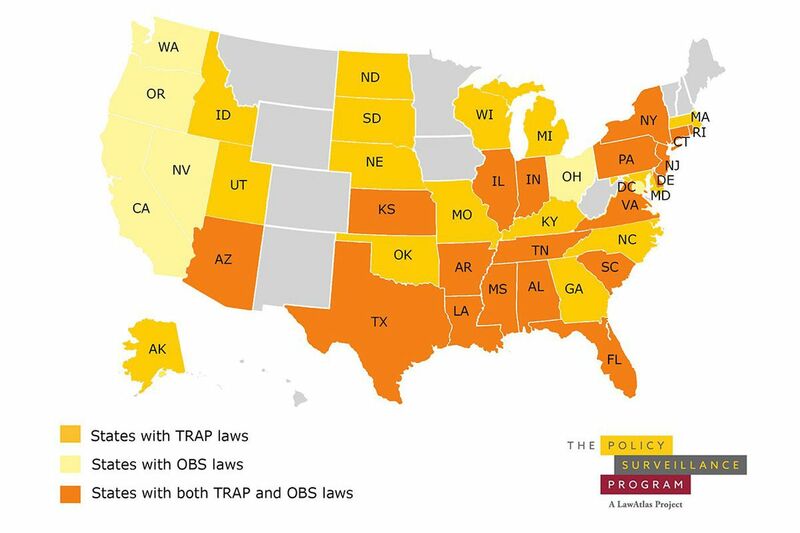 In the interactive legal maps, New Jersey — one of the country's least restrictive states on abortion — shows up as having a TRAP law because it mandates that abortions after 14 weeks be performed in a licensed outpatient surgery facility. Pennsylvania, meanwhile, passed a controversial licensing law in 2011 that requires abortion clinics to be on a par medically with outpatient surgical centers. However, state health officials granted some waivers of certain standards, unlike in Texas. Pennsylvania's abortion control law also mandates counseling, a waiting period, and parental consent for minors – restrictions not addressed by the study. In the wake of the Supreme Court ruling, TRAP laws in at least two states, Alabama and Mississippi, have been limited by court decisions. Cloud and her coauthors believe more laws "may be vulnerable to legal challenge." "To the extent that TRAP laws reduce access to health care services in the absence of countervailing benefits, they threaten to undermine public health," the researchers concluded.